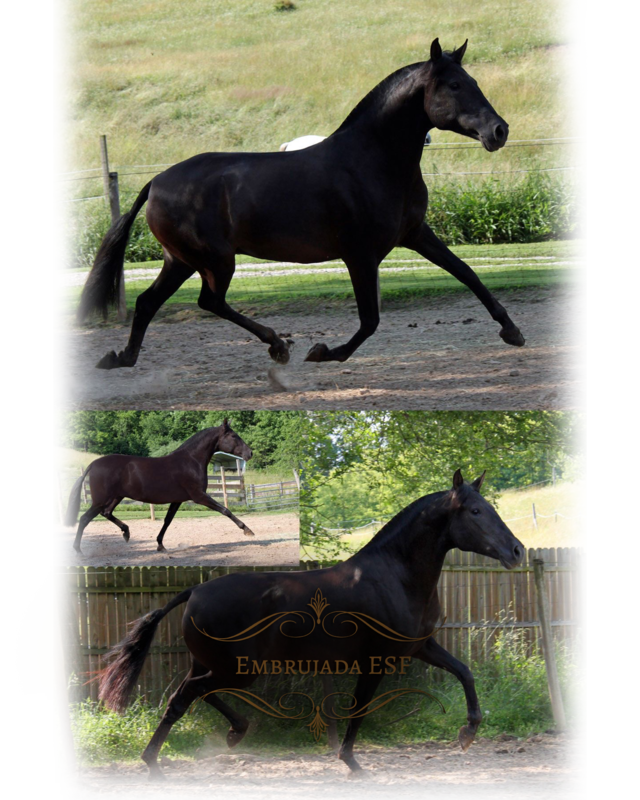 Embrujada ESF is a heterozygous black mare, carrying Chestnut (Eeaa), standing 15.3 hands. Her sire is the black Grand Prix stallion Fetichin. Her dam is Estrella CXV, a Leviton granddaughter. Embrujada, in addition to her excellent conformation, has wonderful temperament, intelligence, confidence, and superior movement. She brings a nobility to our breeding program that we are honored to have. Embrujada is in foal to the imported Black/Bay stallion Ciclon IX for 2019. Ciclon holds Championships in both Functionality and Senior Stallion Classes. We look forward to the arrival of this new one!